The Single Page Application we will deploy in this tutorial can be found on GitHub. The backend exists here. The app should show a list of public meetups. When a user is logged-in, a list of private meetups should be shown. Unfortunately, neither of them shows on the screen. Why? We are not connected to a live backend. Open up utils/meetup-api.js. The BASE_URL constant is connected to a local server instance. Let's change the value to a backend URL. In the previous tutorial, we deployed our backend to several cloud platforms. All we need to do right now is choose one. Let's go with the Heroku backend URL which is, https://meetupservice.herokuapp.com. Replace the value of the BASE_URL constant with https://meetupservice.herokuapp.com. Now, run the app again. 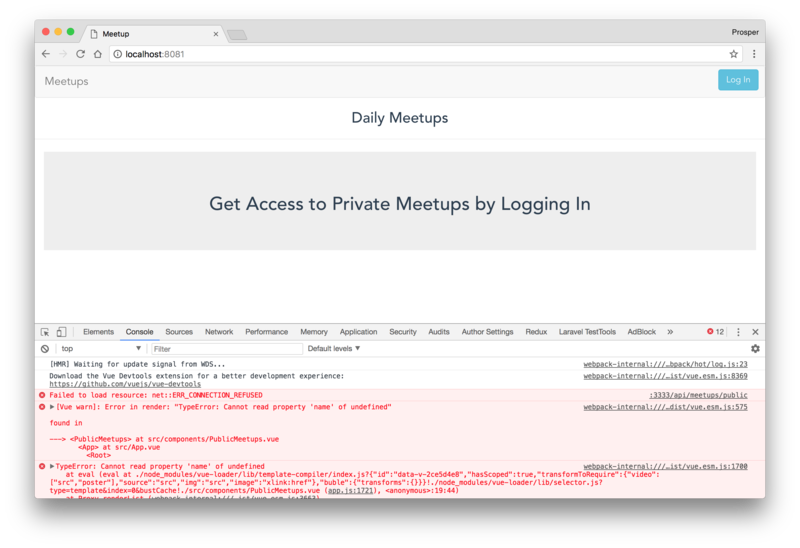 Note: At this point, the private meetups page are not working because we haven't configured the right variables. At this point, we are running the Single Page Application on our local machine. Let's make the app publicly accessible by deploying to the cloud. 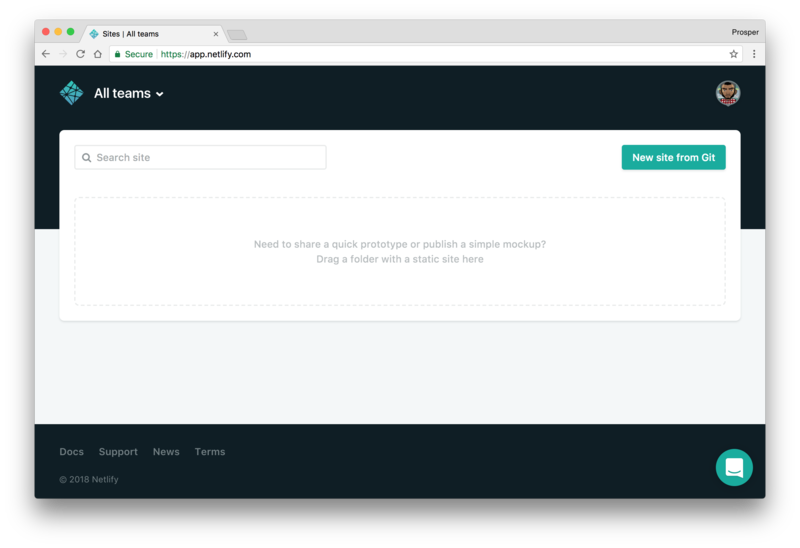 Netlify is a powerful platform that allows you to easily push frontend code and have it deployed to the cloud within few minutes. And you can get started for free. It generates a secure publicly accessible URL after deployment. Every time a change is made and pushed to the GitHub repo, a fresh deploy happens automatically! Let's go ahead and deploy our app. Create an account on Netlify if you don't have one. Choose the branch, set the build command and the publish directory. In our case, the build command is npm run build, the publish directory is dist. Let's ensure everything works well. 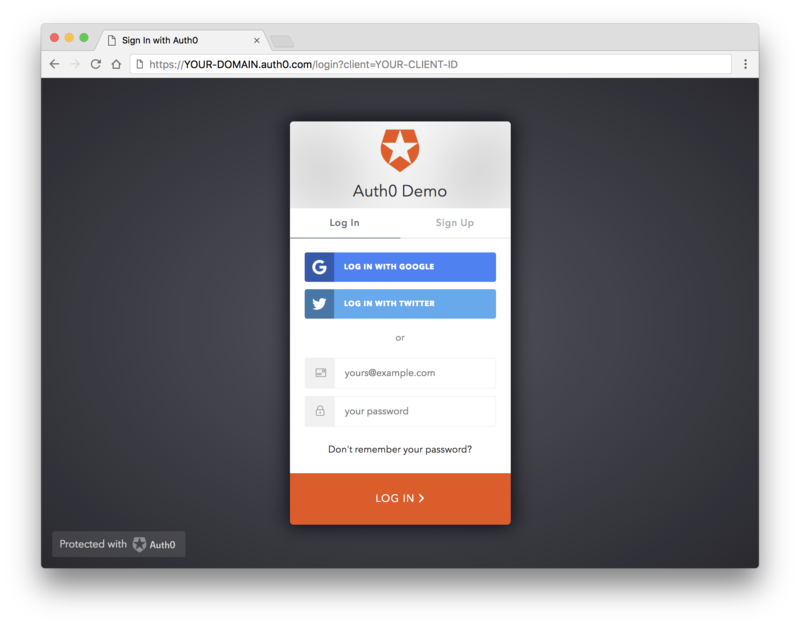 We are using Auth0 for authentication. Ensure Auth0 is configured properly. 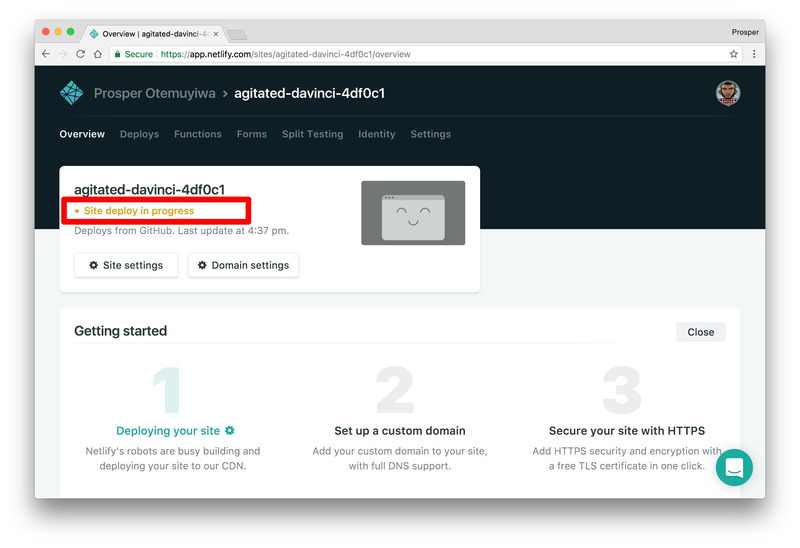 In the Settings for your new Auth0 application, add your URL, in my case https://agitated-davinci-4df0c1.netlify.com/callback to the Allowed Callback URLs. Replace the clientID in the SPA with the client id from your Auth0 dashboard. Replace redirectUri in the SPA with the Allowed callback URL from your Auth0 dashboard. Ensure the Allowed Web Origins, Allowed Origins(CORS) in your Auth0 dashboard is set to your live URL. In my case, https://agitated-davinci-4df0c1.netlify.com. Your audience should be the audience you set when you created the API for the backend. "build": "node build/build.js && mv _redirects dist"
Now, commit the new changes to GitHub. 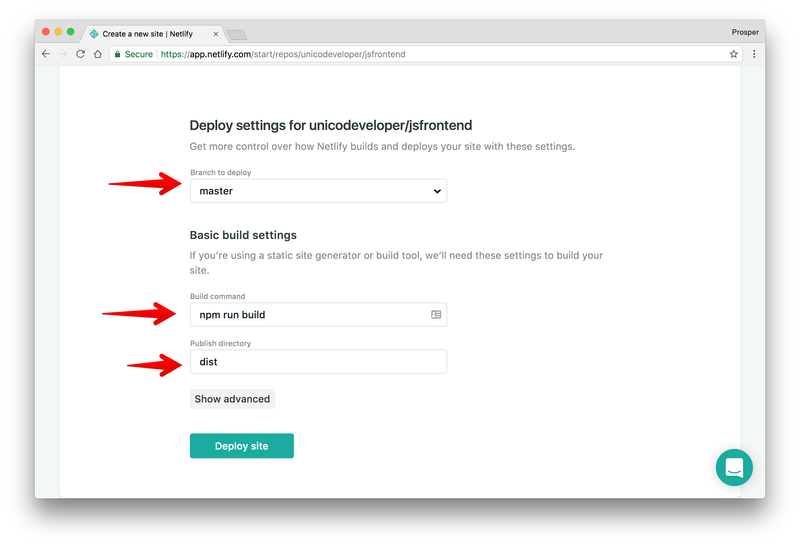 Once you commit, a deploy process will commence on Netlify. And the _redirects file will be moved to the dist folder on Netlify server. Netlify serves the content of the dist folder as the app, so our SPA routing will work fine! "build": "node build/build.js && cp dist/index.html dist/200.html"
Surge's way of handling SPA client-side routing is providing a duplicate of your index.html as a 200.html file in the root of the folder that gets deployed. The 200 page helps you re-route all requests to your client-side application, improving the usefulness of your URLs. Check out the URL it generates and visit your app. In my case, it is http://sable-robin.surge.sh. Very Important Note: At this point, you will need to add this URL to the Allowed Web Origins, Allowed Origins(CORS), and http://<your-url.sh>/callback to your Allowed Callback URLs in your Auth0 dashboard. Furthermore, you'll need to update your src/auth/Auth.js file. Replace the value of redirectUri with http://<your-url.sh>/callback. Your app will be updated. Everything should work fine now! Google Firebase is a great platform to host your static websites, progressive web apps and single page applications. 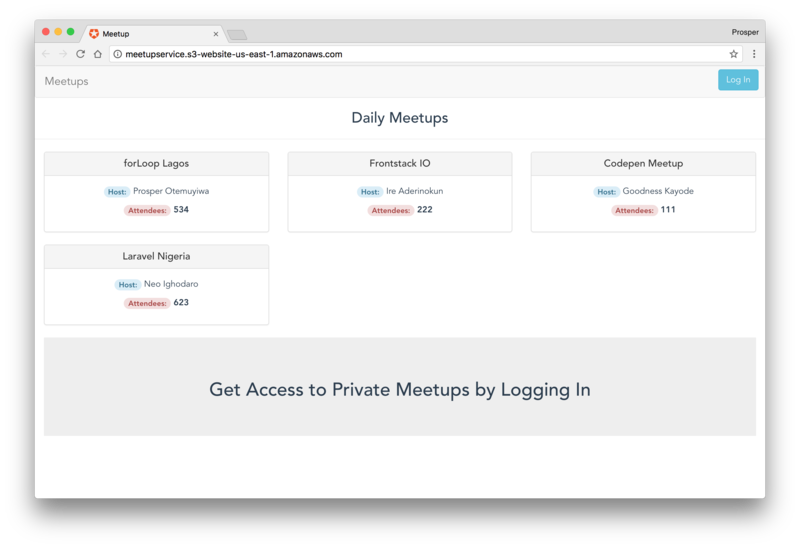 Firebase hosting provides fast and secure hosting for your web app. With a single command, you can easily deploy web apps and static content to a global content-delivery network (CDN). Authenticate with your Google account and give Firebase CLI the permissions it requests by clicking the Allow button. Choose Hosting as the Firebase CLI feature provided in the interactive widget. Select Create a new project. Head over to https://console.firebase.google.com to create a new project. Run firebase init again in the terminal. Go through the steps and choose the newly created project. public is mapped to the dist folder. This ensures that the content of the dist folder is uploaded. The rewrites rule is to enable client-side routing for our app. The project should be live now. Mine is https://meetups-61634.firebaseapp.com/. Very Important Note: At this point, you will need to add this URL to the Allowed Web Origins, Allowed Origins(CORS), and http://<your-url.firebaseapp.com>/callback to your Allowed Callback URLs in your Auth0 dashboard. Furthermore, you'll need to update your src/auth/Auth.js file. Replace the value of redirectUri with http://<your-url.firebaseapp.com>/callback. Now, run npm run build to rebuild the project. Run firebase deploy again to re-upload the new content. Aerobatic is a platform for deploying static websites and single page applications. It's not so popular but it is very powerful and provides a blazingly fast performance. Unfortunately, as at the time of this writing, Aerobatic doesn't support HTML5 pushState. There are claims that it does support client-side routing but I haven't found a complete example to back up this claim. Amazon Web Services as we already know is an incredible cloud platform for hosting your web applications. 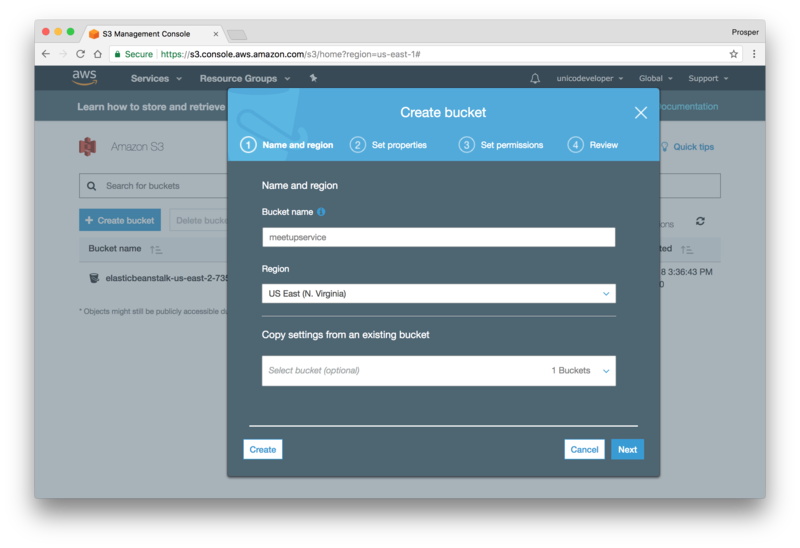 Amazon S3 is a web service offered by Amazon Web Services (AWS) that provides storage through web services interfaces. You can also host a static website and Single Page Application on S3. 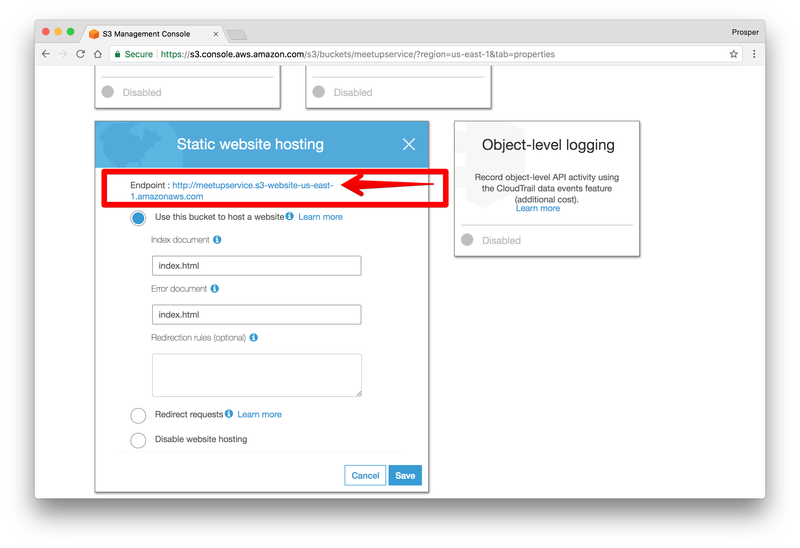 Go to Properties of the newly created bucket and enable Static Web Hosting. Add index.html to the Index and Error document. Note: Write down your URL endpoint. Principal: This is the who. Using a *, we're saying everyone. Literally, everyone. Action: This is what the principal can do. We're saying everyone can perform a "get." Resource: This is the which. Against which resources (objects) can the principal perform this action? Remember the endpoint URL you wrote down? You'll need it now to configure authentication for our app. At this point, you will need to add this URL to the Allowed Web Origins, Allowed Origins(CORS), and http://<your-url>/callback to your Allowed Callback URLs in your Auth0 dashboard. Furthermore, you'll need to update your src/auth/Auth.js file. Replace the value of redirectUri with http://<your-url>/callback. Now run npm run build in your terminal to build the project. 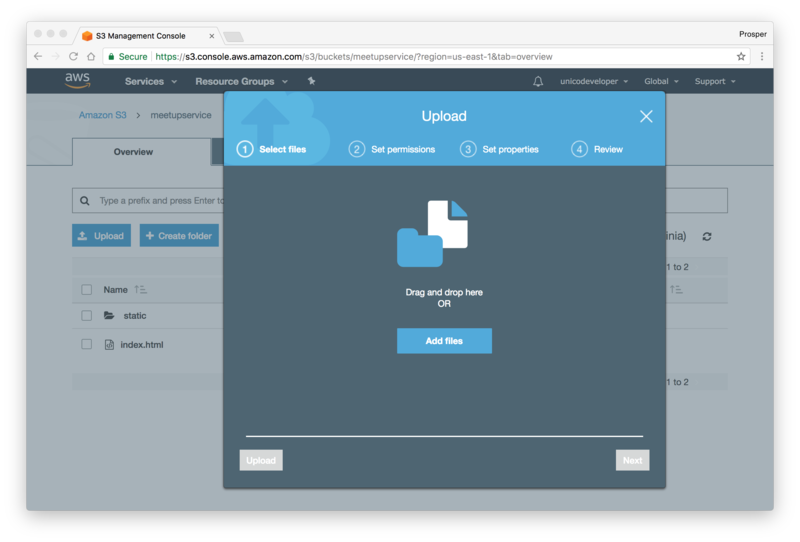 Go ahead and upload the files in the dist directory to your S3 bucket. Wait about a minute. Now check out the app via your S3 endpoint URL. http://meetupservice.s3-website-us-east-1.amazonaws.com. Let's briefly cover some of these questions posed above. Pay only for the compute time you consume. 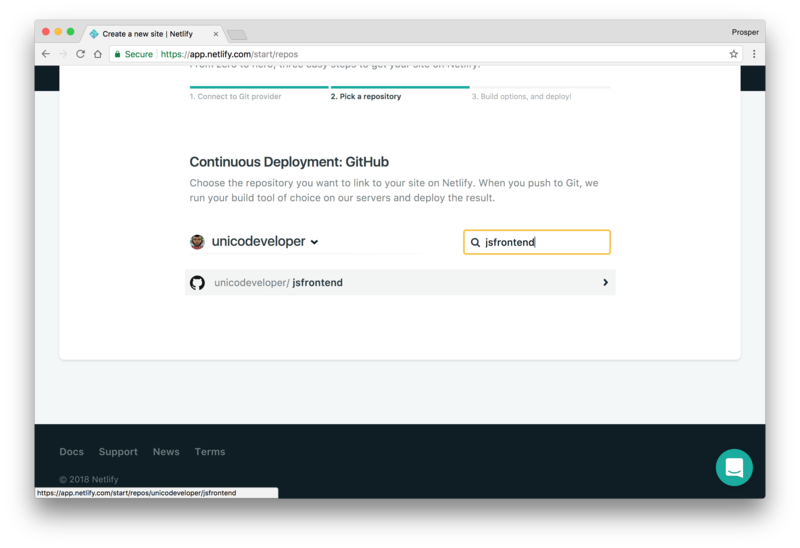 Services such as Webtask, AWS Lambda, IBM Cloud Functions, Google Cloud Functions, and Azure Functions allow you run a serverless backend. Webtask: Get started with Webtask. AWS Lambda: Get started with Lambda. 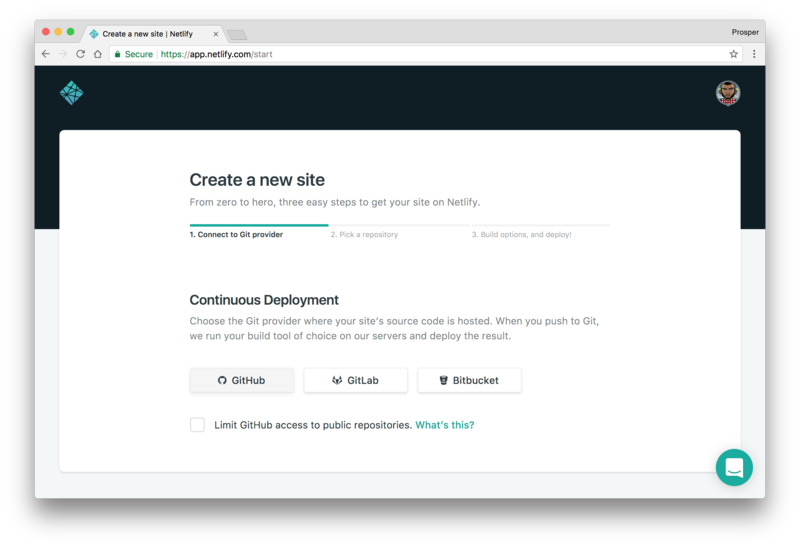 IBM Cloud Functions: Get started with IBM Cloud Functions. 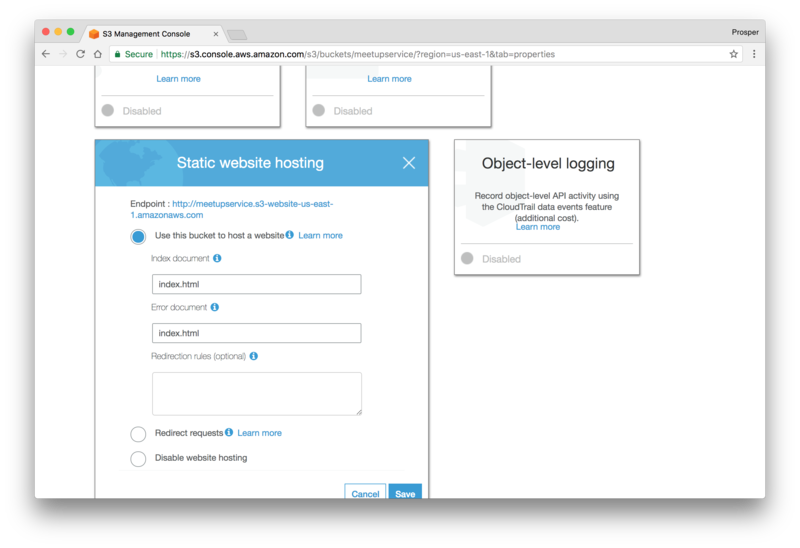 Google Cloud Functions: Get started with Quickstarts. Azure Functions: Get started with Azure Functions documentation. 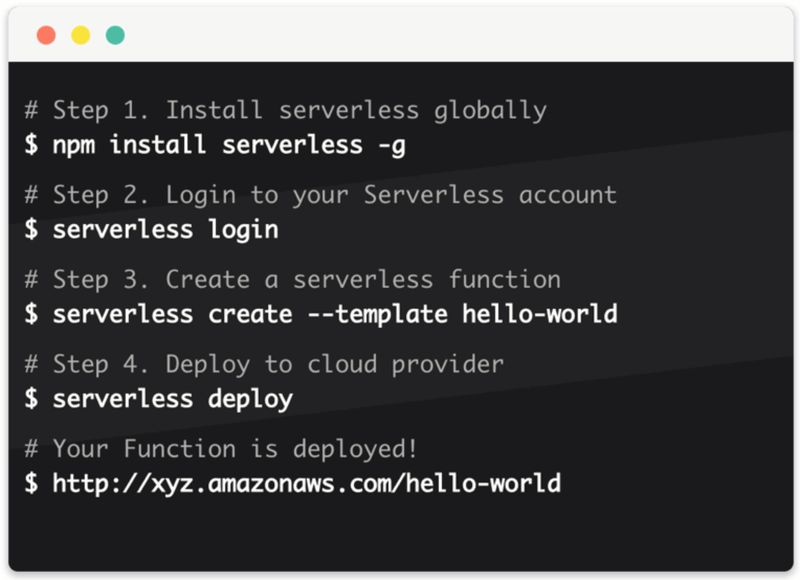 There is a Serverless Application Framework that helps you build serverless architectures easily. It's powered by Serverless computing services such as Lambda, Azure Functions and IBM. With the open-source CLI, you can get started on your machine ASAP! It's recommended that you use a dedicated service for handling files such as images, PDFs, documents and videos. As a developer, always offload these media assets to dedicated storage services. Services such as Cloudinary, Filestack, Uploadcare, Imgix and Fastly. 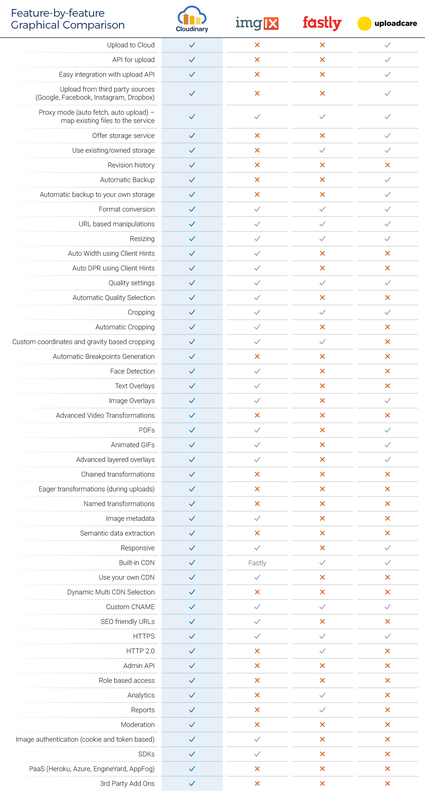 This is a feature by feature graphical comparison of the various services mentioned above with the features they offer. Fastly does not provide any SDK. It simply operates via a query string URL API call. Imgix offers SDKs for Ruby on Rails, Python, React, PHP, Node.js, Go, C# and Java. 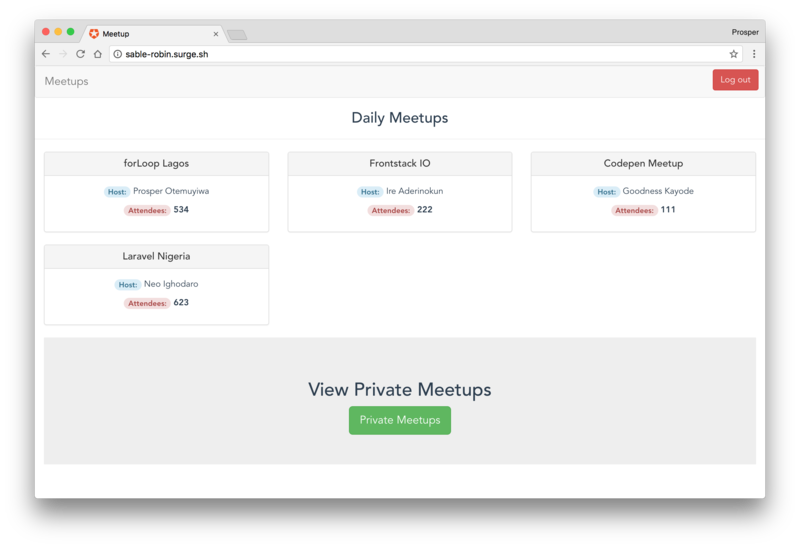 Uploadcare offers SDKs for Ruby, Ruby on Rails, Python, PHP, Java, Angular, Android, iOS, and Meteor. After deploying your app, the next step is to set up logs and monitoring for the application. Performance monitoring and logging allow you understand everything going on in your app. User interactions, application errors, and issues. All these statistics offer you a better understanding of your app and userbase, which ultimately provides you and your team with better focus areas. Every website should be secured to protect users' private information. An SSL Certificate is required to be installed on the server where the website is hosted. SSL certificates allow web servers to encrypt their traffic, and also offer a mechanism to validate server identities to their visitors. An SSL Certificate needs to be purchased from a trusted Certificate Authority such as GoDaddy, RapidSSL, Verisign, Digicert, etc. SSLs aggregates several SSL providers and provides discounts on SSL purchase. However, Let's Encrypt is a Certificate Authority that offers free SSL certificates. 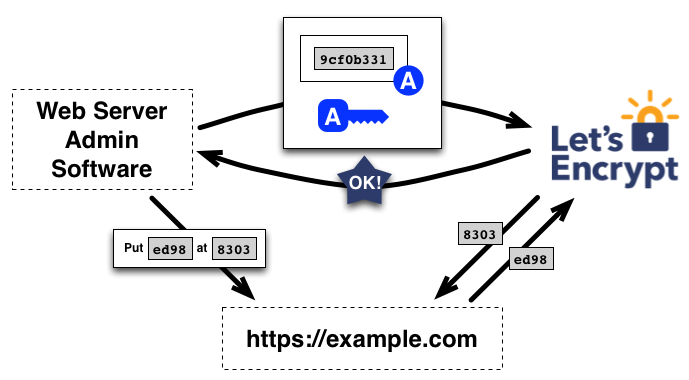 Check out how to get started with Let's Encrypt.